When people look at the nutritional content of foods, they tend to concentrate more on calories, protein, fats and vitamins. Most of the time, people forget to consider the dietary fiber content of foods. In recent studies, it was shown that in America alone, less than half of the population gets enough fiber in their diet. Roughage or dietary fiber is the indigestible part of plants that travels through the digestive tract. In an overview, it helps the body absorb more water and improves elimination of wastes. It also helps in the absorption of nutrients and other chemicals. There are 2 types of fiber. The soluble fiber is the one responsible for lowering blood cholesterol levels. Because of this, intake of enough soluble fiber will reduce your risk of developing heart diseases and stroke. Insoluble fiber increases bulk that your body needs to maintain the functions of your stomach and intestines. This type of fiber prevents you from experiencing constipation. What are the benefits of getting enough fiber in your diet? Having enough fiber provides you with bulk. It helps you have well-formed and soft stool so wastes can pass easily. With this, you are sure not to have constipation. When you have diarrhea, adding fiber to your diet will help you absorb water and form bulky stools. It is also said that fiber can help relieve patients with irritable bowel syndrome. Having a high fiber diet also reduces your risk of developing hemorrhoids, diverticulosis and diverticulitis. 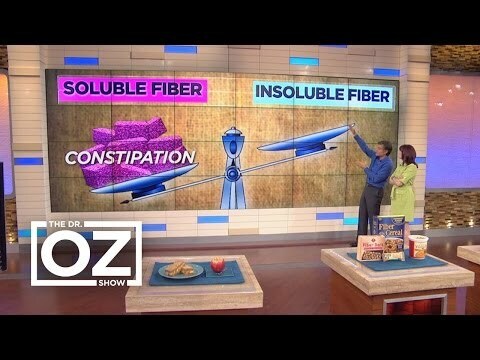 Since fiber helps you pass stool easily. There is no need for straining during defecation. This is one of the ways fiber helps prevent these health conditions. Soluble fiber helps maintain an ideal cholesterol level by reducing the amount of Low Density Lipoprotein (LDL) in your body. LDL is also called as bad cholesterol. It has also been studied that fiber can also lower your blood pressure. Maintaining a good blood cholesterol level puts you at lesser risk of developing heart diseases. This is one of the reasons that most diabetic patients add fiber in their diet. Getting enough soluble fiber aids in the absorption of sugar in your body. It helps your body absorb sugar slowly so diabetics can avoid sudden peaks on their blood sugar level. Enough insoluble fiber in your body is also said to prevent development of type 2 diabetes. Eating foods with high-fiber content may require you to chew your food longer than you would any other type of food. Because of this, your body is given enough time to think that you are already full. This would lessen chances of over eating. A high- fiber meal will also lower down hunger cravings because fiber takes a longer time to be digested. You feel full longer when you eat food with high fiber content. Fibrous foods also have fewer amounts of calories in them. So no matter how much fiber you eat, you won’t have to worry about the number of calories you are taking in. Fiber is also said to fight off carcinogenic agents, thus lowering your risk of getting certain types of cancer. If you want to improve your health the natural way, adding more fiber to your meals is a healthy idea. Previous Post: Depression and Women – How Common Is It?